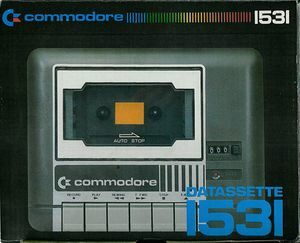 The Commodore datassette VIC-1531 (Commdore 1531, in Germany VC-1531) was developed for the commodore homecomputers C16, C116 or Plus/4). The only functional difference between the 1531 and the more common 1530 is the connector. The 1531 has an 7-pin mini-DIN-round pin plug. One cannot connect these datasettes to the home computers C64, C128 or VIC 20 without the use of a special adapter. The color of the VIC-1531 is often dark or sometimes beige-white. This page was last modified on 13 April 2019, at 16:56.